sys = thiran(tau, Ts) discretizes the continuous-time delay tau using a Thiran filter to approximate the fractional part of the delay. Ts specifies the sample time. Approximate and discretize a time delay that is a noninteger multiple of the target sample time. The time delay is 2.4 s, and the sample time is 1 s. Therefore, sys1 is a discrete-time transfer function of order 3. Discretize a time delay that is an integer multiple of the target sample time. If tau is an integer multiple of Ts, then sys represents the pure discrete delay z–N, with N = tau/Ts. Otherwise, sys is a discrete-time, all-pass, infinite impulse response (IIR) filter of order ceil(tau/Ts). thiran approximates and discretizes a pure time delay. To approximate a pure continuous-time time delay without discretizing, use pade. To discretize continuous-time models having time delays, use c2d. where D = τ/Ts and N = ceil(D) is the filter order. See . 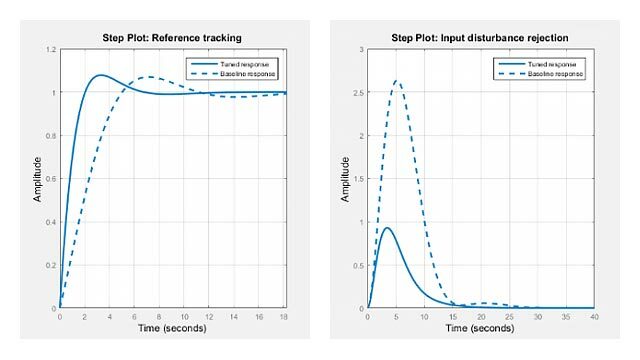 T. Laakso, V. Valimaki, “Splitting the Unit Delay”, IEEE Signal Processing Magazine, Vol. 13, No. 1, p.30-60, 1996.